In need for uninterrupted Internet Access? Combine wired and wireless Internet connections and create your own Hybrid Internet Access solution. Boost your Internet speed and forget downtime by deploying the optimum connectivity experience! traffic is routed via our ultra fast dedicated cloud servers. Choose the right plan and boost your Internet Speed and Reliability – comBOX Hybrid Internet Access service bundles can make an impact on your business. Interested in Reselling comBOX services? Optimized bandwidth aggregation : IP-layer link aggregation of multiple wired and wireless Internet connections for increased bandwidth. Wireless backup connection support : Smart (transparent) failover to wireless connections when wired connections fail. Seamless, same-IP failover : Ability to survive network outages without a change in public facing IP addresses allowing for session continuity. End-to-End, bi-directional Quality of Service (QoS) : Ability to dynamically prioritize traffic on a per-packet basis over multiple Internet connections from the customer’s Network to the service provider’s core. Bi-Directional Acceleration : Performance enhancing network proxy which mitigates the impact of packet loss and high latency and accelerates TCP traffic. Real Time Network Compression : Ability to accelerate compressible traffic types beyond the traditional speed of the individual connections. By aggregating multiple low cost wired and wireless Internet connections, the comBOX Hybrid Internet Access service bundles guarantee your connectivity, with higher speed and availability than traditional Internet leased lines. 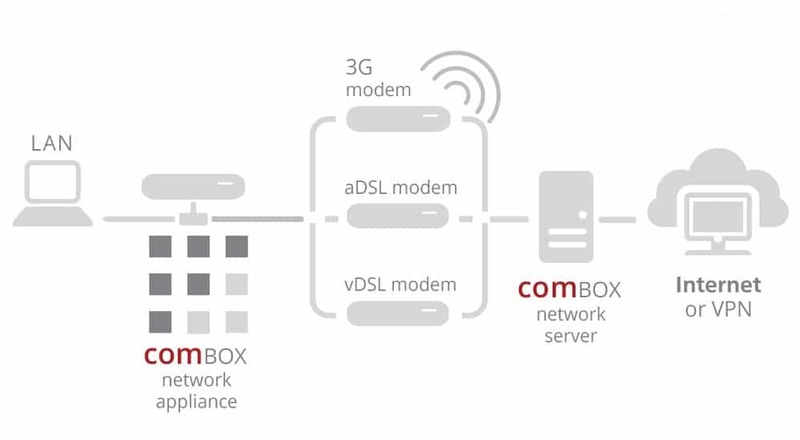 With comBOX Hybrid Internet Access service bundles you can combine ADSL, VDSL, 3G/4G and other wired and wireless connections for faster and ultra reliable Internet in the most cost efficient way.